As we were ceaselessly reminded during the recent Books in Browsers conference, held last month at the Internet Archive in San Francisco, publishing is in an extraordinary evolutionary flux. For three exciting days, we pondered the very basic tenets of the industry, including the role of the publisher and the exact nature of the “book,” a noun that does indeed now require quotation marks. Our own experiments in publishing continue at a pace, including a title we’ve named “Book: A Futurist’s Manifesto.” A collection of essays co-edited by Hugh McGuire and Brian O’Leary, the “Manifesto” is e-first/print-second and financed like a start-up, with early investors paying less for the ground-floor content than latecomers will pay for the completed product. See below for a short excerpt from co-editor Hugh McGuire discussing the “big, exciting unknown” of digital-first publishing. There hasn’t been a more interesting time in publishing since that fellow Gutenberg was around. We hope you’ll keep up with us as we both track and lead the trends. We welcome your suggestions and feedback. Please email us at toc-newsletter@oreilly.com. The day-by-day schedule of sessions, workshops, keynotes, and events has just been released. If you’re planning on joining us in New York this February, don’t forget best pricing discounts end today at midnight ET. “Wake up and smell the disruption,” GigaOm warned of Amazon when it launched its own publishing arm. One thing we can certainly smell is Amazon’s lack of self-reporting. What makes a Kindle title a Kindle best-seller? Your guess welcomed. But in a recent paidcontent.org piece, journalist Laura Hazard Owen does some hard math to reckon Amazon’s angles and comes up with figures and pointers we found surprising. Porter Anderson offers a highly entertaining account of attending three publishing conferences in 10 days. He focuses on Books in Browsers highlights amid a slate of general tomfoolery nicely folded in with the odd deep thought or three. Edward Nawotka also attended, returning with a hit-list of high points and happy neologisms (books are experienced, not read) including Spook, which, as anyone knows, is a Spam book. What part of DRM-free don’t most publishers understand? Matthew Ingram writes on the “balkanized” state of the ebook and the frustration that locked text needlessly imposes on readers. “There is a greater shift afoot than just pricing and delivery mechanisms, and that is what this book aims to explore. We want to examine how digital changes the process of making a book, as well as what we do with it afterwards. The move to digital is not just a format shift, but a fundamental restructuring of the universe of publishing. This restructuring will touch every part of a publishing enterprise–or at least most publishing enterprises. Shifting to digital formats is “part one” of this changing universe; “part two” is what happens once everything is digital. This is the big, exciting unknown. O’Reilly publisher and general manager Joe Wikert is an amiable guy with an inexplicable love for cheap, industrial, Mexican food. When he’s not snacking on salsa, Joe is loving up Amazon and thinking about publishing. The latter two concerns collided last week with Amazon’s announcement that they would begin an ebook lending library that rewarded publishers with a flat rate, regardless of a title’s popularity. Joe is rarely miffed, but this really stuffed his relleño. He writes: “I hope Amazon reconsiders and switches this program to a pay-for-performance model. That’s the only way I’ll ever support it as a publisher.” We invite you to join this conversation. BYO tacos. 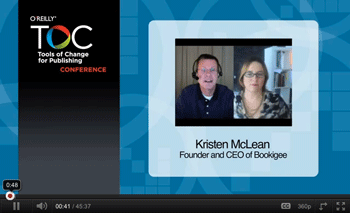 Joe interviews Bookigee founder and CEO Kristen McLean on the advantages of using the agile model to develop content that readers actually want.